Pilgrims greet Pope Benedict XVI in his vehicle as he arrives at Cuatro Vientos, near to Madrid, Spain, Sunday, on Aug. 21. 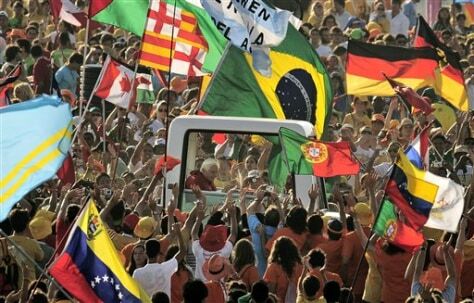 The Pontiff was in Spain for a four-day visit on the occasion of the Catholic Church's World Youth Day. More than one million young pilgrims participated in the event, authorities said.